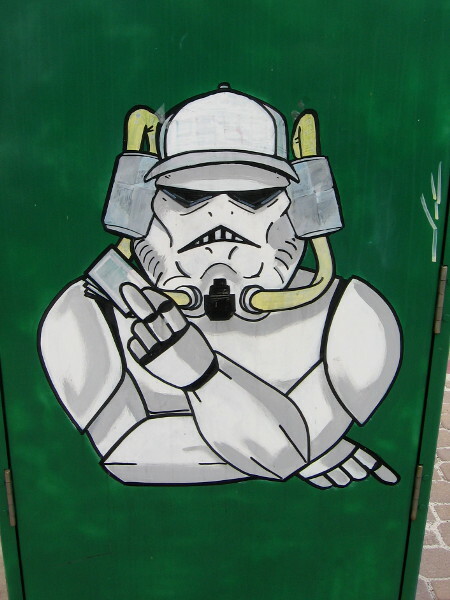 Cool–and funny–Star Wars street art! – Cool San Diego Sights! 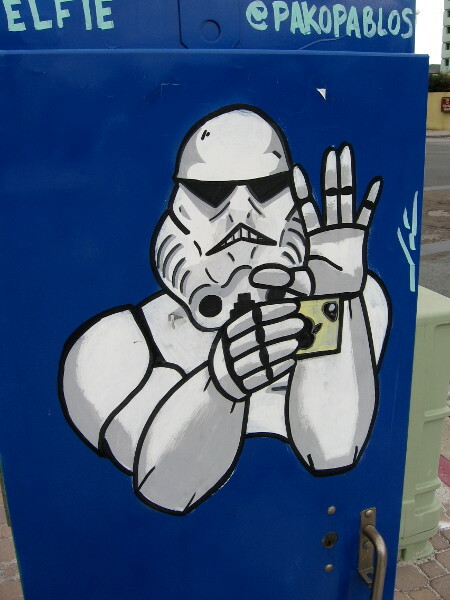 Cool–and funny–Star Wars street art! Join me, says Darth Vader. Never, replies Luke Skywalker. An epic lightsaber battle commences. Here’s more super cool street art! 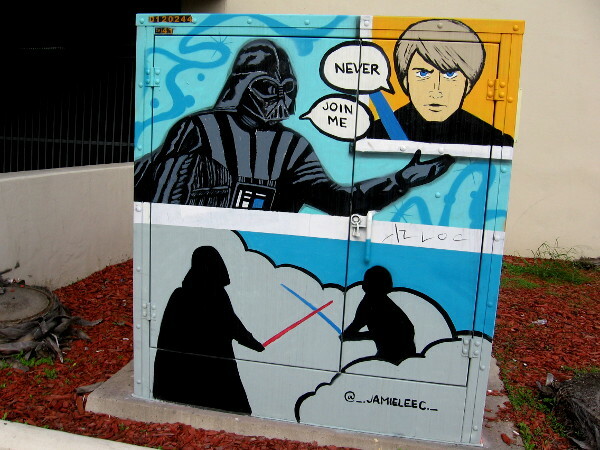 A classic battle between the dark and the light, and iconic movie characters recognized around the world are painted on two utility boxes in National City! You can spot them near the intersection of 8th Street and National City Boulevard. This bold street art is an homage to the original Star Wars trilogy. The final four images might make you laugh! 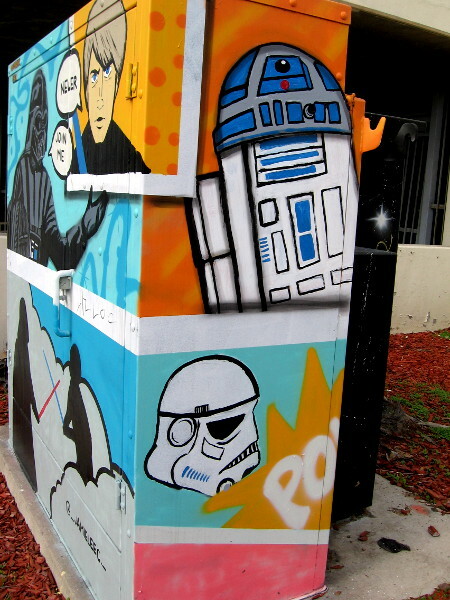 Like a comic book or graphic novel, the right side of this utility box is painted with two more panels of Star Wars street art. I see good old R2-D2 and the white helmet of an Imperial Stormtrooper. 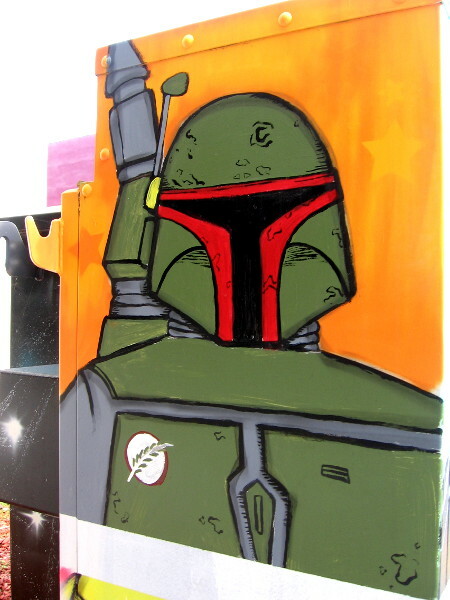 Bounty hunter Boba Fett, a popular Star Wars character, makes for some super cool street art! I photographed this image on the left side of the same utility box. 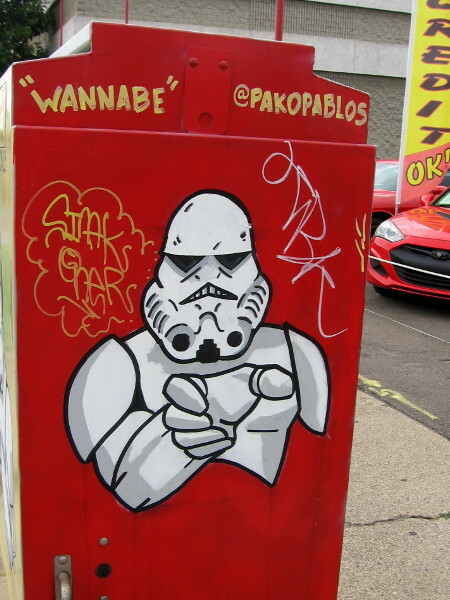 Pop culture icon C-3PO from Star Wars movies, television and other media has also been painted on the side of this utility box. Wannabe Stormtrooper on a second National City utility box seems to idolize Darth Vader and his mastery of the Dark Force. 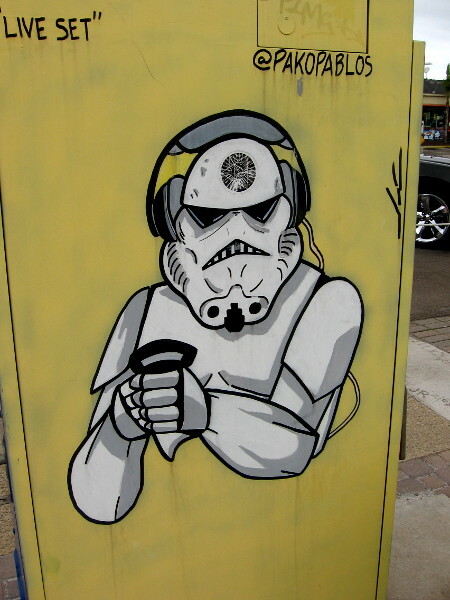 Live Set Stormtrooper likes listening to tunes while battling the Rebel Alliance. Perhaps that’s why those lasers never seem to hit anything. Poker Face Stormtrooper has beer hoses entering his helmet and a hand of cards. Selfie Stormtrooper thinks he looks good. Some funny Star Wars street art in National City! Pingback: Fun photos for those who love Star Wars! – Cool San Diego Sights! Previous Previous post: Japanese video game characters in fun street art! Next Next post: Life in downtown San Diego is dynamic!